Golaem’s developers at the 2019 Technology & Engineering Emmy Awards ceremony at NAB in Las Vegas. Three other crowd-simulation tools developers also won awards this year. 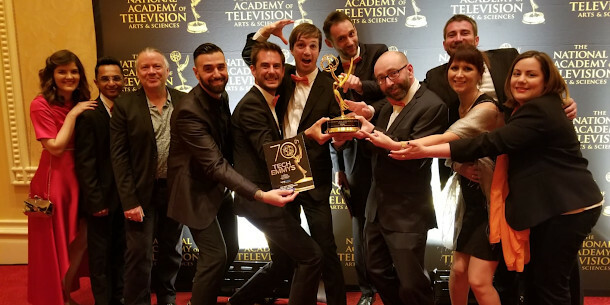 Epic Games and Unity Technologies have both won Technology & Engineering Emmy Awards for their work in pioneering the use of game engines in animation production. The developers of four crowd-simulation technologies – standalone tool Massive, Maya plugins Golaem and Miarmy, and Houdini’s built-in tools – also win technical Emmy awards. The awards were presented on Sunday during a ceremony at NAB 2019. Both Epic Games and Unity Technologies picked up their awards for pioneering the use of game engine technologies for real-time rendering in animation production. Epic Games posted a round-up of recent projects on which Unreal Engine had been used when the awards was first announced last year, which ranged from episodic series to virtual sets for live broadcasts. Unity’s own round-up was less varied, focusing primarily on Baymax Dreams, a series of three experimental Big Hero 6 spin-off shorts, created in partnership with Disney Televison Animation. The awards also recognised what Emmy organisers The National Academy of Television Arts & Sciences described as “cost-effective crowd simulation tools”. They include the granddaddy in the field: Massive Software’s Massive, originally created for the original Lord of the Rings movies, and more recently used on shows like Netflix’s A Series of Unfortunate Events. It was joined by two newer Maya plugins: Golaem’s self-titled software, used on Game of Thrones, and Basefount’s Miarmy, used on a range of high-profile Chinese, Korean and Japanese projects. The line-up was rounded out by Houdini’s new-ish crowd toolset, used by The Mill in recent commercials. Other categories of technology covered by this year’s awards ranged from automated audio conformation to the use of HTML5 in broadcasting by way of X-band radar trucks for weather forecasting.